We might have the OUA analogue to Randy Moss joining a loaded New England Patriots offence last season, not to overstate things. 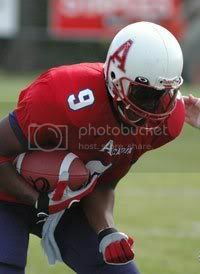 Six-foot-4 wide receiver Ivan Birungi (pictured), who was a two-time Hec Crighton finalist at Acadia in 2005-06, will play his final CIS season with the Gee-Gees. The school just announced it in a press release. The Moss comparison is hyperbole, of course. However, consider that Josh Sacobie had a sick, somewhat Bradyesque 21-to-4 TD-to-interception ratio last season, when he was working with a few first-time starters on offence, it fits. Sacobie is as polished a passer as you'll find in the OUA, and now he's got a receiver who will always get double- and triple-coverage on important passing downs. Birungi was a big factor in Acadia winning back-to-back Atlantic conference championships, and presuming he's fit, he'll give the the Gee-Gees a big target who, as football types say, can get separation from defenders, especially in the red zone. It's not as if the Gee-Gees had small receivers last season. Cyril Adjeity is 6-foot-2, Matthew Bolduc is 6-3. Birungi, though, might be on another level when he has to catch a pass in tight space. The Gee-Gees have always been better than most teams at utilizing big receivers, from current B.C. Lion Adam Nicolson a couple years ago to the Tounkara brothers, Ousmane and Ibrahim, about a decade ago. They already stacked up as a solid pick to win the Yates Cup and go the Vanier against the evil empire from Quebec City, and this is just a cherry on the sundae. Coach Denis Piché's statement is bang on: "There is the potential for something crazy this season." The Gee-Gees also have former Saint Mary's receiver Ron Kelly, former Queen's centre Sean O'Donnell and former Golden Gaels linebacker Ian Hazlett in camp. The latter two are former OUA all-stars. The Quebec conference is apparently not be outdone when it comes to a offensive star switching schools: The Sherbrooke Vert et Or, as was rumoured last season, have confirmed former Montréal Carabins star Joseph Mroué, who was a 1,000-yard rusher at the U de M, is attending their training camp. This is an outsider's opinion, but depending on how quickly Mroué can get up to speed, Sherbrooke could have a very good running game. Their entire offensive line is back and QB J.P. Shoiry put up good passing numbers last season. There's going to be a few people picking them to wrest second spot in the QUFL away from Concordia.